Will, already checked for that. Kept the hub face perpendicular to the floor. Moved through the range of motion without moving too far in or out. I think I am OK there, but thanks for the suggestion. That would be a problem if missed. The hub face does not stay in one plane as it travels up and down. It actually goes in and out as it goes up and down. It also changes camber as well. The safest way to check is to install the drive train as guru has advised. How many degrees does it change? Rickady88GT why do you think there is no way to calculate how the travel of the suspension affects the axle? It's just math and geometry. It is measurable and predictable. It's just math and geometry. It is measurable and predictable. Well of course... but you may run into difficulties if you try to implement that strategy in practice. You'll have to measure everything... including pick-up points on the car. The accuracy of the result will depend on the accumulation of measurement uncertainties for each part. Depending on the accumulated uncertainties, the accuracy may be useless for what you're trying to compute (but that's an analysis for you to perform). Or, you can do the empirical measurement which tests the drivetrain as it shall be used. The 3rd alternative is to roll the dice and not do any further verification. We don't have the luxury of a 3D CAD file of the Fiero, or even the paper drawings used in Fiero's design (which pre-dated CAD). When you don't have the CAD, you have to modify your work methods accordingly. You could spend days detailing all the critical parts of the components (tripod lobs, tripod housings, strut travel limits, pivot points for all the suspension components, etc) and then use some cad system to cycle to the limits to verify, but then the accuracy of the result will be in how precise you did the modeling. In 30 minutes or less you can verify the actual install and know exactly what you have. The tripots are where most of the issues arise. As the angle increases, the lobes can bottom out inside the tripod housing, over extend and come out of the tripot housing, or the axle shaft could interfere with the tripot housing directly. This is why I like to do this check with the tripot boots removed and the grease cleaned out so I can better see what is going on. Iin the picture above, I actually had to cut the first set of grooves off the tripod housing to make it shorter so it would clear the axle. A lot of people over the years skip this step and they drive the car for a long time w/o issue. Then one day they hit a large bump, go over some rough tracks, or encounter something that causes the suspension to either hit the compression or extension limit, bind the tripot, and break the tripod, axle, or transmission case. Any custom swap really should have this checked to avoid issues at a later date. Even if everything clears, you need to leave some clearance for the drivetrain movement on the mounts under acceleration and engine braking. Yes, I do get the importance and the variables involved. Thanks for the feedback. I did take all of the points you have mentioned into account when making the mounts. I would be interested in how much camber does change through the span of travel of the suspension. I can't imagine it is more than 5 or 6 degrees, but I haven't measured it. I could be way off. Next issue, the LFX from the Impala had a 2 wire oil pressure sender. The new programming on the ECM calls for a 3 wire unit. I think the 2 wire is for cars with idiot lights and the 3 wire for a guage. I'm showing photos of the engine where the sender lives. As it turns out I now need two senders, one to feed info to the ECM and one to feed the Fiero oil pressure guage. Also, the original Impala sender had 16mm threads, the Camaro that I have to use to match the ECM is 14mm. The Fiero sender is 14mm tapered pipe thread I think. I ordered the adapter shown to adapt the Camaro sender, but am still considering my options for where to put the Fiero sender. As I see it one option is to drill and tap one side of the adapter and mount it there. Does anyone have other ideas? Are there other places on the LFX that can be used for oil pressure? Do you not have diagrams? Why are you not certain where that wire goes? If the Camaro sensor has a 0-90 ohm pressure transducer in it, it should drive the Fiero gauge just fine. I'm not wondering about the wires. I want to know if there is another place on the engine to get oil pressure from. Two sensors at the stock location is a bit tight space wise. Will, are you saying that using one transducer to feed the ECM and the stock Fiero gauges will not interfere with one another? If you haven't seen it yet, check out Bloozberry's build thread in the construction zone. 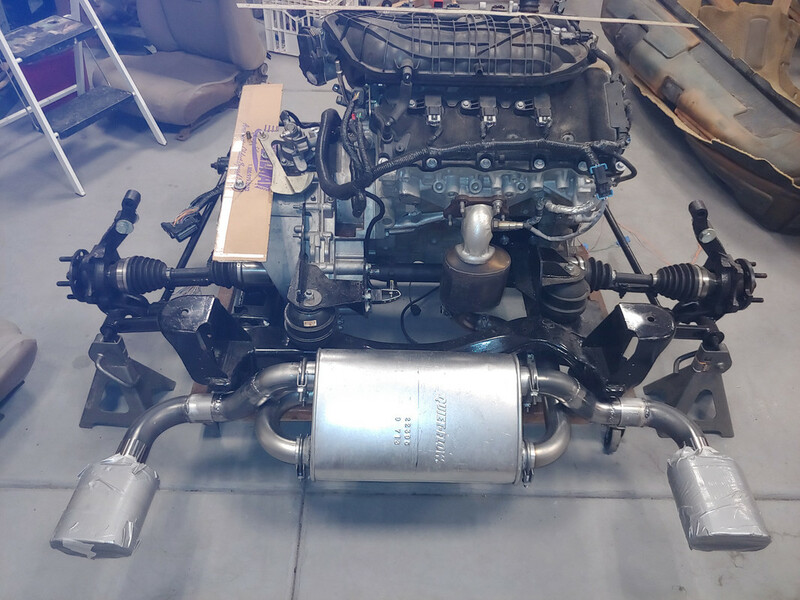 He took the time to document in great detail the front and rear suspension coordinates for the 88 fiero and with the help of another member Zac88GT was able to run them through a suspension analyzer program. That is just what I wanted to see. If I read this correctly the camber changes about 3 degrees through the range of motion. If that is all it varies, I am golden. What guru has not mentioned is that he offers a kit that helps to minimize that camber change. He can tell you the details. I will include the link. 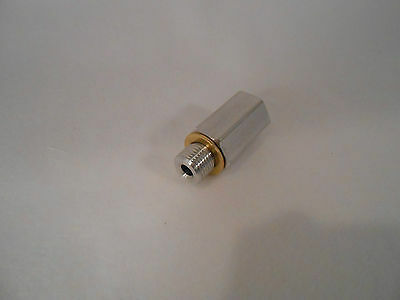 If you decide to use it, your Fiero sender is 1/4" NPT. If you need a Fiero sender, the 88 Fiero senders are considered better / more reliable, so consider that as an option. The main difficulty I see with drilling and tapping the adapter is that in order to intersect the longitudinal passage, the hole you drill can't be very deep, so as to avoid drilling through to the other side. Therefore, you may need to start cutting with a regular tap, and then switch over to a bottoming tap. Edit: you could even cut a thread off the end of the tap every time you cut the hole one thread deeper. Also, I suppose that the sender would point upwards, and that looks close to the exhaust pipe, so it may need a shield. Good info! Thanks! I will need to prefit the adapter so I know which side is up when tight. 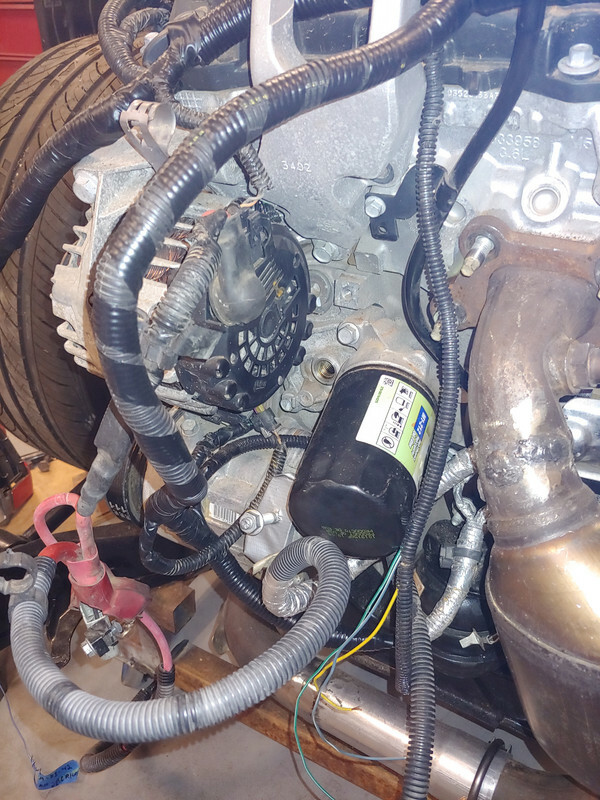 I was hoping there would be somewhere else on the engine to pull oil pressure from, but I don't see an obvious place and I've gotten no tips from the forum, so I guess I just have to fit both sensors in that small space. Have you tried to remove the oil filter housing? Once it is off, you might see another oil boss, or a flat part that would be easier to tap for a sensor. Depending on how the housing seals to the block, you might be able to make a flat spacer and drill/tap it for the second oil sensor. You might also find that some of the other oil filter housings from other high feature engines are easier to add an oil sensor port to. There are also spin on filter extensions that allow room for oil cooler as well as oil ports. One of those might fit the filter assy as well. You can also inspect the sides and ends of the block looking for caps or plugs that might have access to the oil galleys in the block. So there are several other paths you could explore to mount the 2nd sensor. The ECM input will have an impedance ~100k ohm. It won't interfere with the gauge. Does the ECM control a variable displacement oil pump based on this sensor's output? I haven't heard of the LFX having a variable displacement oil pump, but I could be wrong. So GM has finally started giving the ECMs an oil pressure sensor? All other applications I've seen run the oil pressure sensor wires straight to the dash. I guess if they go to the ECM, then the ECM can put them on the CANBus for the instrument panel to read. If that's all it does, hook them both up to the same sensor. However, if the ECM controls a variable displacement oil pump, then you probably want to find a spot for another sensor. I don't know if GM would have made significant updates to the sensor in order to make it reliable or precise enough to control the pump. 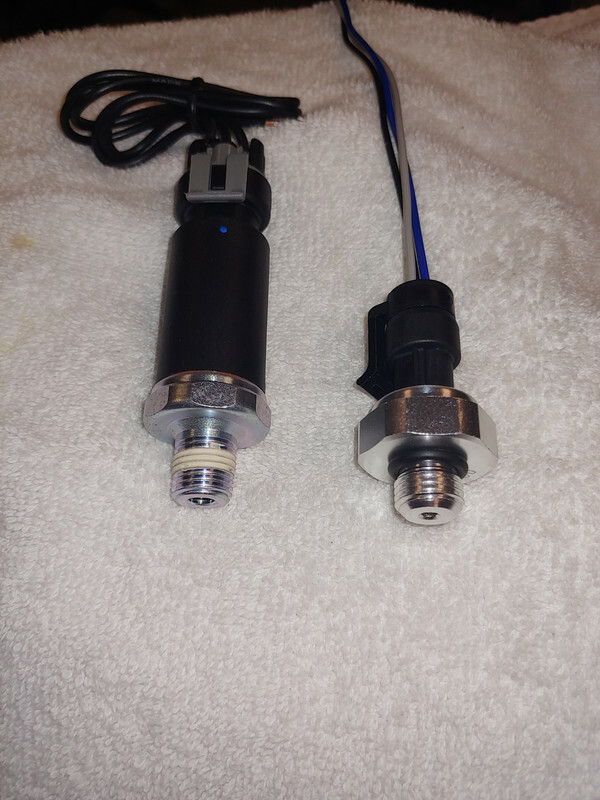 Basically almost all (if I say "all", FieroGuru will find one that doesn't...) GM oil pressure senders are essentially the same: 0-90 Ohms, just like a fuel level sender. How they're packaged isn't relevant to how they operate. The Caddy Northstar and Olds Aurora units, for example, had larger pipe threads than the other units GM built. Weird. Thanks for the info. That's what I love about this forum. I learn so much. I like the sandwich plate idea - a small external oil cooler might not be a bad idea. Setrab/Mocal makes a sandwich plate with a built-in thermostat. You could also use a manifold block, but there's a good chance you'd need an adapter or to rethread one since you probably won't find one with the threads you need. Most manifolds are aluminum, so rethreading is pretty easy. Just be sure the sensors you are using a two wire sensors, as an aluminum manifold will offer a crap ground path. Two of those terminals are for the oil pressure switch that provides the parallel path to energize the fuel pump. The third wire is for the gauge sender and grounds through the housing. Thanks for the info. I'm still learning this stuff. So why do you say aluminum gives a poor ground? Just finished fitting the exhaust. Now on to wrapping it. What's the piece of cardboard for? Is it to simulate the frame rail, so that you can build things on the engine without having to put it in the car to check for interference with the rail? On an unrelated note, they really don't make intake manifolds nice-looking nowadays... my friend's Subaru looks like that with the ribbing to keep the manifold from imploding. No, the intake manifolds don't look to great, but making it out of plastic and redesigning the heads saved 20 pounds. The LFX weighs about the same as the stock 2.8. Was there a plastic manifold for any LLT application? One can build headers for an LLT, but not for an LFX. FieroGuru makes a very nice shift bracket and cables for the F40 setup.. I have a set and have test fit the bracket only thus far. The camaro LFX intake manifold, although still plastic and ribbed, should be able to be reversed and utilized and V8Roadsters makes a nice carbon fiber cover for it.. Yes, I know he does, but i'm really having fun fabricating. I never knew it was so much fun . So is there a big problem with using the stock Impala intake? I seems yo fit the space well and allows for over 300 hp. Whatever route you take, don't use a Getrag Select cable for the shift cable... The shift motion puts it beyond the usable limit, which will cause buckling on aggressive 2-3 upshifts and you will eventually break it... that is how I ended up with my current solution that has been rock solid going on 5 years and 40K miles. Sorry for being so uninformed, but which cable is the Select and what is the other cable called. I really need to learn the names of these parts. Shift cable is for the front to back movement at the shifter. It connects to the ball end on the large lever with the counter weight and rotates the shift shaft at the transmission. Select cable is for the side to side movement at the shifter. 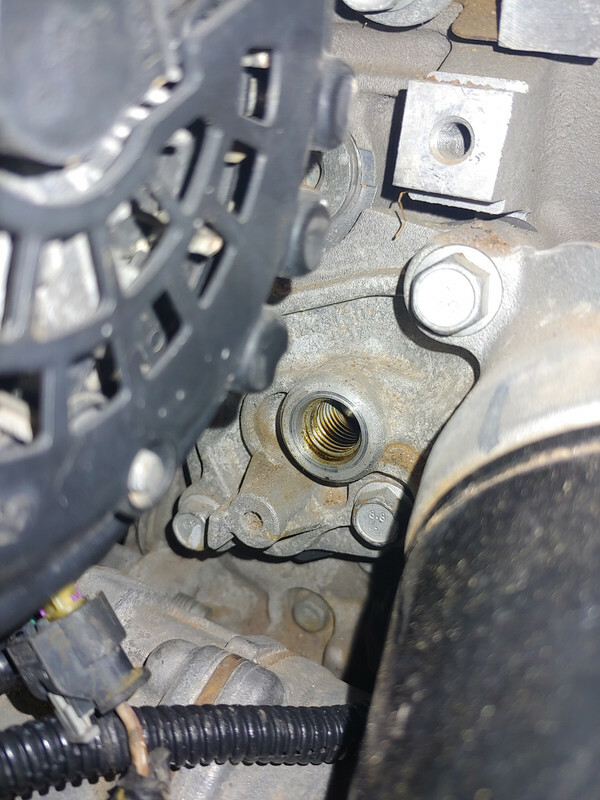 It connects to the ball end on the metal bracket right next to the shift shaft and moves the shift shaft in and out of the transmission. The shift cable is the one that is abused during aggressive upshifts. Thanks for the explanation Guru. I looked at your site just now. You are a talented guy. I recall looking into that and at the time felt that the Camaro intake wouldn't fit when reversed because of interference with other stuff. I didn't actually try it though. I have the Impala intake and have filled and ported it. No flow or dyno tests yet but it should be adequate. You are probably correct... "can" it fit? probably, but one may have to pull other items off the camaro LFX to do so, valve covers, etc... as far as it being reversed all I have is anecdotal statements from miata owners performing an lfx swap and pics of the lower intake manifold bolt pattern. This just blew my mind. I did not know LFX Miatas were a thing. Check out Monster Miatas. LS motors too.